Six months ago the European sovereign debt crisis was flaring up and my chart of the week was the Flight-to-Safety Trade. With the joint EU-IMF bailout of Ireland unfolding over the weekend and the future of Greece and Portugal in the euro zone also being called into question over the course of the past two weeks, this seems like a good time to compare the performance of Europe against some of the other continents. 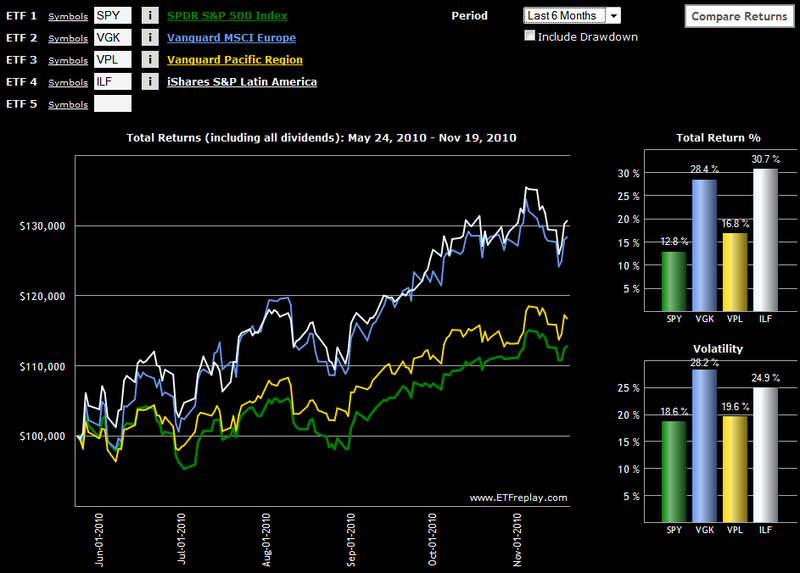 While relative performance is almost always dependent upon the date one picks as a starting point, I still think many will be surprised to see in this week’s chart of the week below that at least over the course of the past six month,s Europe (VGK) has performed on par with Latin America (ILF) and has significantly outperformed Asia (VPL) and the United States. Should Europe be able to finish the year without giving up any ground to its counterpart regional ETFs, I think the continent should be allowed to exhale and declare victory, at least for 2010.